Choosing the menu for a rehearsal dinner can be tricky. For one, it’s typically a much smaller and more intimate gathering than than the wedding dinner. You want it to be special in its own way, but you don’t want it to outshine the wedding dinner, either. 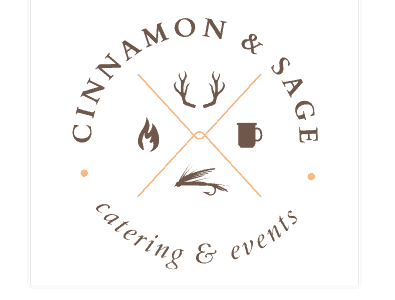 Fortunately, when it comes to weddings and rehearsal dinners, we have seen just about everything and we love working with couples to put together their dream menus. 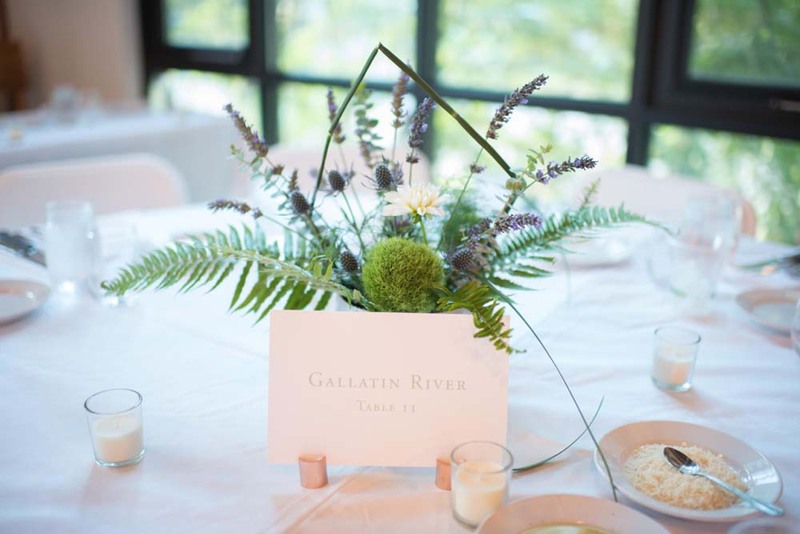 We’d like to share with you a few tips to help you plan the perfect rehearsal dinner. In many ways, the rehearsal dinner is just as important as the wedding dinner. You want it to be memorable –– after all, this might be the only quality time you get to spend with family and close friends who are part of the ceremony before the madness of the wedding day. To make sure you don’t serve your guests the same dish twice, we suggest that you have a planned menu for your wedding dinner confirmed. After you’ve nailed down the wedding menu, the rehearsal dinner will be much easier to wrap your head around. If you and your partner have different food preferences or eating habits, the rehearsal dinner could be a great opportunity to include another favorite meal into the wedding memories without compromising the wedding dinner menu. An easy way to make your rehearsal dinner stand apart from the wedding dinner is to choose a different style of service for each meal. For example, try serving a plated meal for your rehearsal dinner and a family style meal for the wedding. 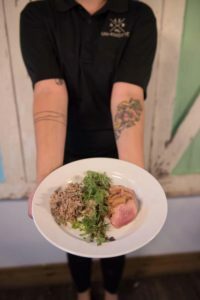 Since rehearsal dinners are more exclusive than the wedding day meal, serving a plated rehearsal dinner meal is a great way to bring the most important people in the ceremony together in a classy, memorable way. The proteins are usually the star of the show –– most menus are built around the meat options in order to achieve a good balance of flavors and nutrition. If you are serving beef for the wedding dinner, you might choose bison or elk as the main feature of the rehearsal dinner menu. This same rule applies for vegetarian menus. Choose a unique style of cuisine. Contrasts are a good way to make the whole wedding experience unforgettable. 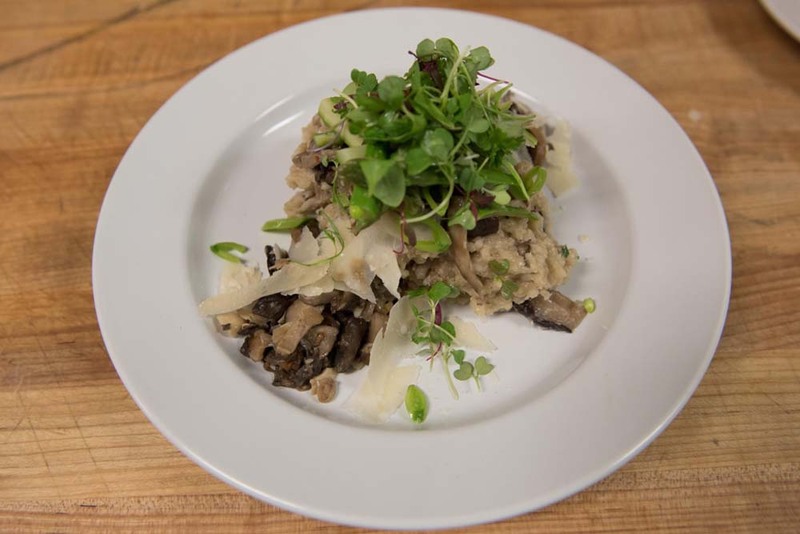 If you are going with traditional Montana food for your wedding then maybe Italian would be a beautiful option for a rehearsal dinner. Since rehearsal dinners are usually held the night before the wedding, you want to serve food that won’t interfere with the next day’s festivities. For example, it’s generally best to avoid serving heavy, greasy, all-you-can-eat foods like fried chicken, pizza, or anything too spicy the night before your big day. You want your guests to feel energetic and fully charged for the hustle and bustle of the main event. 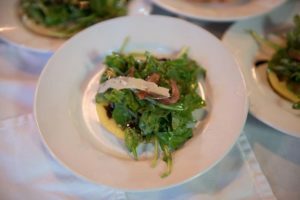 At the very least, provide your guests with the option of lighter fare like salads to round out the main course. Take a page from our book. 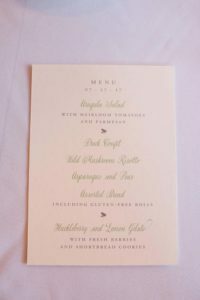 For the wedding, this couple chose to have a traditional Montana-style menu served family style. They served Montana beef tenderloin with a red wine reduction sauce, citrus jalapeño salmon en papillote, a grilled summer vegetable medley, sweet potato and Yukon gold gratin, fresh dinner rolls, and mixed greens Waldorf salad. For the rehearsal dinner, we crafted a different customized four course meal for around 120 guests. From the appetizers to the dessert, this meal was perfectly balanced, simple, and delicious while remaining a pleasant juxtaposition to the wedding menu. Local heirloom tomato salad, arugula, shaved parmesan, pickled red onion with a balsamic vinaigrette. House-made dinner rolls and gluten-free dinner rolls. Duck Two Ways: Seared duck breast and duck confit served over a wild mushroom risotto. Seared duck breast and duck confit served over a wild mushroom risotto.